Dog-Gone-It (The Pet Beverage) takes care of pet and large animal odor problems - from the inside out. 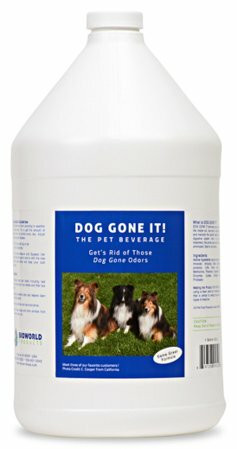 Dog-Gone-It (The Pet Beverage) is all natural, very safe and is easily added to the water or food dish. When used consistently, the pet odors are significantly reduced or completely eliminated. Small dog or cat - 1/2 to 1 ounce per day Large dog - 1 to 2 ounces per day Horse, farm animal - 2 to 4 ounces per day Adjust amount as odor dictates. Contains minerals and enzymes that assist in a more efficient digestion of food. Use daily to naturally balance and maintain the critical functions in the digestive system. After 1-2 weeks of treatment, animal odors will be significantly reduced or eliminated. 3.2% Enzymes (Amylase, Cellusase, Lipase, Protease), 0.6% Amino Acids (Methionine, Lysine, Threonine, Tryptophan). 100% all natural, odorless and tasteless product. Safe for pets of all ages - newborn to very old. Add to food and/or water. If you have any questions about this product by BioWorld USA Inc, contact us by completing and submitting the form below. If you are looking for a specif part number, please include it with your message.